Many brides get overwhelmed planning for and executing everything for their big day. Just getting the basics prepared, organized, and to the venue can sometimes be a major feat….now, don’t think I’m hating on everyone, if you know me then you know I am planning to give you some of my typical self deprecating examples. Examples that I’ve learned from in trying to plan my own wedding and the reasons why I decided to start planning and designing weddings…here we go. 1. Makeup artist was 2 hours late (I should have been communicating throughout the morning and keeping tabs on how her progress to the venue was coming along…and whether she knew the right venue to attend) so I ended up doing the majority of my own makeup, as did some bridesmaids. 2. When the photographers arrived to start taking pictures, our flowers were delivered about the same time. We immediately realized the bouquet stems weren’t wrapped (just floral tape), but we were very short on time, so we improvised….with heinous white bows that will plague me until my death. 4. When I first visited our venue (I have no idea WHAT I was thinking in booking that place…) they showed me the arch they typically used for weddings….complete with fake ivy, fake flowers, and Christmas lights–gag. I said that I absolutely didn’t want to see that thing at any part of the night, that I had my fabulous aunt doing all the décor. Well, my aunt spent hours hanging ornaments and draping fabric and crystals for the perfect wintery backdrop……..and someone from the venue put the damn arch right in front of everything beautiful she had installed. 5. I am cheap. I did my wedding on a $11k budget with 200 guests. How did I do that? Well, aside from help from amazing family and friends, I only paid $200 for my DJ…a sweet old man who worked out at the gym with me…who also used CD’s instead of a laptop and didn’t play all of the extremely detailed–down to the minute–list of songs I had prepared. 6. Also to save money, I went with a random, unknown cake baker. When we went to cut our cake (that didn’t look anything like the picture I gave her), we realized that the sheets were incredibly uneven and she had used about 2″ of icing in some spots to make the cake seem level…..wtf!? 7. We thought it would be a great idea to downgrade our limo that we used shuttling the bridal party to a town car for our exit from the venue. We also decided to give up our hotel room to our officiant in favor of spending another night at home with our dog Layla before the honeymoon. Well…..town cars don’t have a separation between the passengers and driver. We sat in silence in the 45 minute ride home because it was SO AWKWARD. Now you know…not even planners get it right the first time…or the second or third. This is why you should have an experienced planner/coordinator on your side to take over on the big day. Someone who knows exactly what you want, will execute your wishes, and will be there to help solve any potential disasters that arise on your wedding day. 1. Rain. You live in Hampton Roads. Chances are that the weather report is going to be wrong and there will be a surprise shower. 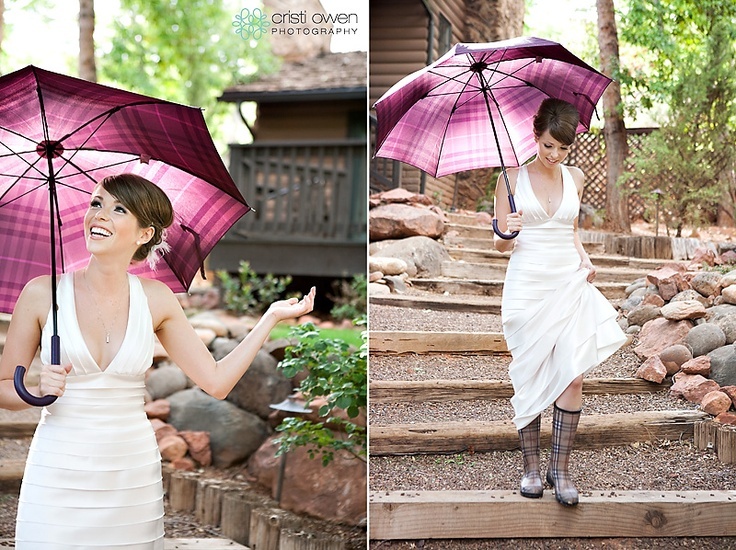 Why not be prepared for the elements with some matching umbrellas or even some cute rain boots that will make outdoor pictures a possibility….and will even double as a cute photo prop!? 2. Wardrobe Malfunctions. I have had two weddings so far THIS YEAR where someone who is an integral part of the wedding party has ripped a dress or split their pants. Though you may actually want to punish them for being careless, gaining weight, or dropping it too low on the dance floor, it’s always a good idea to have a sewing kit, stain remover, static remover, and a lint roller on hand….and someone who knows how to sew! These are all in my emergency kit and have all been used on one occasion or another. 3. Vendor Miscommunications. We have all had conversations with people, whether at work or at home via telephone or e-mail, where you explicitly state something and then one day later the other party has zero recognition of that conversation. While you hire vendors for their professionalism, they are actually human and they make mistakes. This is why I always read through my client’s contracts and call every single vendor prior to an event to make sure that both parties are on the same page with what is expected and what is going to happen on your big day. I create timelines and contact sheets that are sent out 2 weeks in advance (in case we need corrections) so that everyone involved in putting on the event is on the same page. Whether you have a planner or not, you need someone on your team that will ensure you’re getting exactly what you want and have paid for. Copy this person on any e-mails, catch them up on phone conversations, and/or bring them to meetings. The last thing you want to deal with on your wedding day is a big problem that could have been avoided. Barbie’s miscommunication led to a fight on her wedding day….make sure you’re not following in her footsteps. 4. Stick to the schedule. I know, I really do get it…it’s your wedding day and you want to do what you want to do when you feel like doing it. In theory, that’s great. If you have a good planner, things will most likely go exactly as planned but you must plan in advance and make time for everything you want to get done, have it all organized, and then have someone responsible for keeping everything on track. Giving your photographer an extra hour for portraits may sound like a great way to get some cool pictures, but if it means leaving your wedding guests waiting for dinner (which will be cold by the time you arrive because your caterer thinks you’re still on time), it’s just not worth it!! Here’s a link to a free schedule…via pinterest. 5. Keep your guests informed. Guests should be made aware of your event via Save the Dates and should be kept informed throughout the entire process. The easiest way to do this is to create a wedding website and let guests know of that website on your save the date. This is where you would display things such as where you’re registered, hotel information, directions to the venue, event timing, and other imperative details. For example…. your wedding is taking place in the sand on the beach, but you haven’t led your guests to come to this conclusion. Grandma shows up in her 6 inch heels along with her 90 year old partially immobile husband in a full suit and tie. She’s gonna break a leg, he’s going to fall and have a heat stroke…. Even though you’re prepared down to the last detail, just remember not to sweat the small stuff. Things can –and likely will– go wrong, but if you’re prepared and have the right people by your side, nobody will ever know!! Now here’s some pictures of people making the best out of awkward wedding situations! Your dog loves you so much she takes a ride on your train. Your adorable husband-to-be drops your rings in the grass. 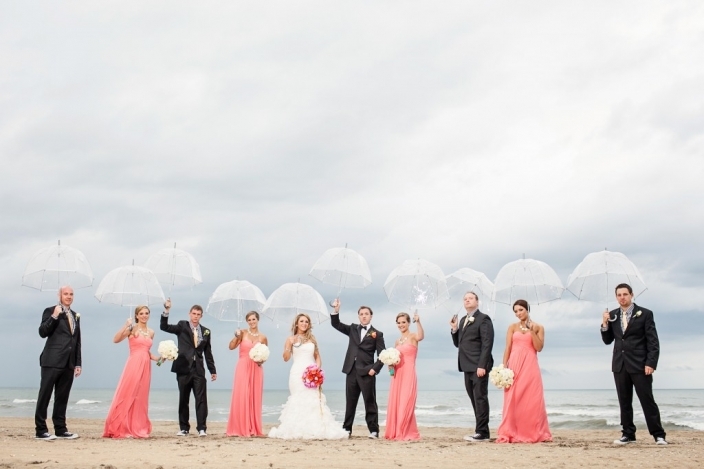 Rainy weddings make for awesome pictures.